Earth’s days are numbered. Eventually, all scientist agree, she will die . . . and all life on the planet will perish. Even if this doesn’t occur due to a catastrophic accident like a massive asteroid impact or an alien invasion, it is inevitable. Inevitable. If nothing else interferes, scientists tell us earth will die in the death throes of its own star. In about 2.8 billion years, the sun will destroy all life here. Before the sun consumes its nuclear fuels and transforms into a “red giant,” it will have scorched the solar system. It’s a disturbing thought. At least, it can be to those who place their hope in the future of humanity. Christians, in contrast, look forward to the promise of a new creation, a new heaven and a new earth, where even the harmony of the cosmos will be restored. For those who believe that ultimate meaning can only be found in the continuing evolution of humanity, it is necessary to see an opportunity to continue the race. Until we evolve into pure mind and energy forms (right!) we need to find a place on hospitable worlds where we can survive, prosper and continue to advance. So, if we assume it’s necessary for humanity to continue to exist, and our days here on earth are numbered, what are we to do? The answer’s obvious. We must migrate to the stars. Baby steps are already being taken, with planning for our first colonies on Mars and our own moon. Many movies have explored establishing our presence in other solar systems. In fact, it’s become a trope of the scifi genre. Some writers and directors envision a welcoming universe. Others populate it with hostile environments and competitors. One of the most disturbing thoughts I have heard in the past few months was voiced by a scientist contemplating this subject. In essence, he said that our observation of nature shows that it is the predators (not their gentle prey) that must become smarter than the rest of the fauna to survive. The presumption being that it is the predator, not the grazer, that would evolve farthest and potentially venture into space. I grew up influenced by the utopian images of Star Trek. 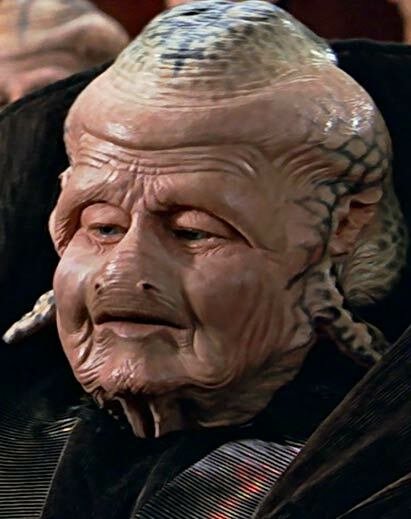 Sure, there were Klingons and other threats out there, but there were also a large number of affable races that were eager to band together and share their knowledge and culture. Star Trek went a step further. Even our one-time enemies (like the aforementioned Klingons, the Cardassians and the Ferengi) could become our allies. Well, there’s a precedent in that here on Earth (think post-war Germany and Japan). Still, it may be a tad naïve when it comes to interstellar swashbucklers. The prolific writer C.S. Lewis wrote a series of books about humanity’s first encounters with life beyond our planet. The Space Trilogy will be of interest to open-minded fans of science fiction, and to people who enjoy learning more about Lewis’ broad interests. The letter [at the end of Out of the Silent Planet] is pure fiction and the “circumstances which put the book out of date” are merely the way of preparing for a sequel. But the danger of “Westonism” I meant to be real. What set me about writing the book was the discovery that a pupil of mine took all that dream of interplanetary colonization quite seriously, and the realization that thousands of people in one way and another depend on some hope of perpetuating and improving the human race for the whole meaning of the universe—that a “scientific” hope of defeating death is a real rival to Christianity. With this, we return to our initial thought. If we are looking to the stars for humanity’s hope, I’m afraid we will ultimately be disappointed. I don’t know if there is mortal life beyond our planet. If there is, I can’t predict whether it would be friendly, or inimical to us. Who knows whether we could even communicate? It’s a mystery for now. What isn’t a mystery, is whether or not we need to look beyond this tiny blue globe. After all, it is certain this world’s days are numbered. Note: The alien at the top of the page is the Regent of the Evora species, a Federation protectorate. I used her image because of the curious marking on the crown of her head. It resembles a tattoo of a cross, but from the lines on the sides of her head I suspect they might all merely be varicose veins. Emoticons. Some people love them. Others find them irritating. I’m in the latter camp. That’s why I enjoyed a comic in the paper this week. * A fifty-something husband and wife are talking as she’s typing on her desktop. Jeannie: I wish I was a little more computer-literate. Charlie: I don’t really care for that term. Charlie: I don’t like ascribing literacy to people who think emoticons are a part of speech. I find the evolution of alphabets fascinating. Primitive pictographs amaze me. Emoticons, not so much. I have to admit that I occasionally use the primitive :) to indicate that something is intended to be humorous, rather than serious. It has served as useful shorthand for written speech, conveying what would be evident in the intonations of oral communication. However, this nouveau-punctuation has mutated into an abomination. Today there are innumerable graphic variations of that once modest “smile.” And some of them are truly bizarre. Now just as we pick out and exaggerate the pleasure of eating to produce gluttony, so we pick out this natural pleasantness of change and twist it into a demand for absolute novelty. This demand is entirely our workmanship. If we neglect our duty, men will be not only contented but transported by the mixed novelty and familiarity of snowdrops this January, sunrise this morning, plum pudding this Christmas. . . . Only by our incessant efforts is the demand for infinite, or unrhythmical, change kept up. This demand is valuable in various ways. In the first place it diminishes pleasure while increasing desire. I realize it’s a bit of a stretch to apply this passage to the subject at hand, but the principle remains the same. When is enough enough? When it comes to emoticons, apparently, that level has yet to be reached. I am not seriously suggesting that there is a conspiracy going on here, but one never knows. Please forgive me if I have offended any Mere Inkling readers who may suffer from emoticonaddiction or some other disorder. It is not my desire to upset you. Feel free to continue your unbridled (ab)use of these tiny monstrosities. Postscript: I must confess to finding one set of emoticons rather amusing. 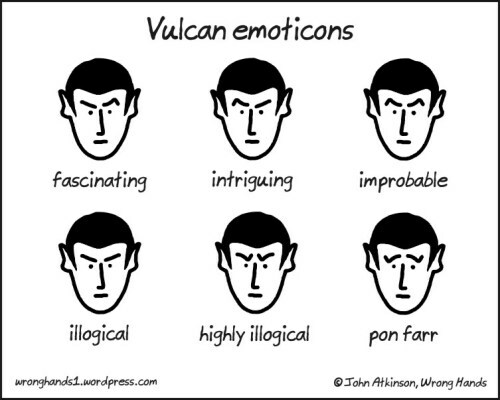 If you are familiar with Spock from Star Trek, you too may enjoy these Vulcan emoticons that exhibit the full range of Vulcan expression. * You can see the strip I am referring to here.